Natural gas companies wish to begin numerous and widespread “fracking” operations inside Dallas. Drilling companies have already leased vast areas of land owned by the City of Dallas, representing almost 5,000 acres throughout the western portion of our city. Some of these are located extremely close to neighborhoods and schools, and much of the area is inside public park lands and the Trinity River flood plain. Now it’s up to us to hold the Dallas officials accountable to that promise! So here’s what we want. Based on the noise, fumes, pollution, and vibration caused by gas drilling, we need a guaranteed 1,000-3,000 foot buffer zone between fracking wells and our homes, schools, and workplaces. The City Plan Commission has now recommended 1,500-foot setbacks, but they are under intense pressure from industry and City staff members to reverse this and allow drilling within 300-500 feet in some cases—less than any other major city in D/FW! Drilling doesn’t belong anywhere close to our parks, either. The gas drilling task force had recommended prohibiting drilling inside publicly-owned park lands, but then reversed itself during its final meeting and voted to roll this back as well. We must protect our parks! 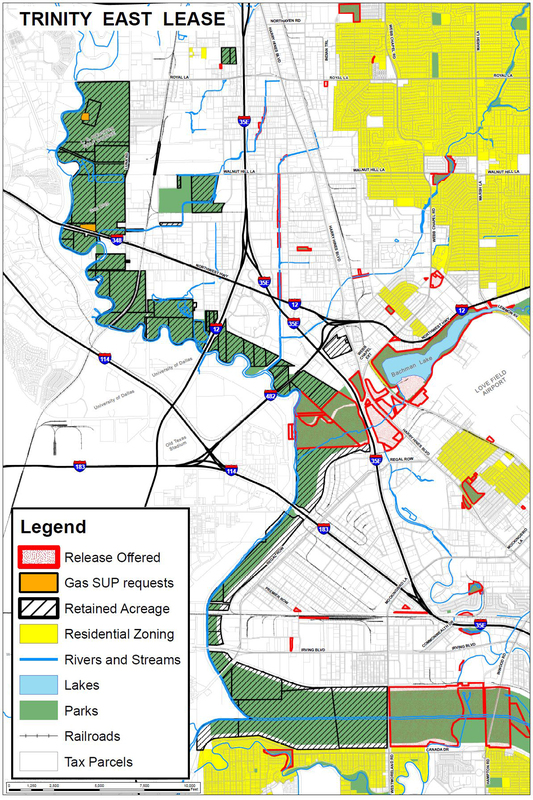 One of the most dangerous proposals is to drill inside the Trinity River flood plain. There are many parks, bicycle trails, wetlands and forested river bottoms that would be at risk if the City Council agrees to this. The Trinity is a natural treasure that we should improve to future generations to enjoy — we shouldn’t create a river of gas wells instead. Each new gas well can use millions gallons of water, all of which is permanently contaminated and is disposed of in special waste sites. Dallas should charge drilling companies more for water that cannot be reused, and restrict water during Stage 3 drought conditions. Gas companies are also asking for permission to truck Dallas water out of town for fracking in other cities! Dallas has a commitment to clean up our chronic air pollution. If the city doesn’t treat the gas industry the same as other polluting industries, that commitment will go up in smoke! The gas drilling task force has urged the city to ensure that air pollution from fracking will be “off-set,” or balanced out, so Dallas will keep its clean air promise. Gas companies can keep the full list of toxic chemicals they use hidden, calling it their “trade secret.” Our first responders are on the front lines every day and will be put at high risk of exposure to these toxic chemicals, but not even Dallas police, firefighters and medical professionals would be given this information until after an accident occurs! The new ordinance should require full chemical disclosure. Gas compressor stations are huge, loud and disruptive industrial facilities, each one putting tens of thousands of tons of pollution into our air every year. These facilities could pose an unacceptable threat to neighborhoods, but the current proposal does not treat them any differently than normal drilling sites. Dallas should create stronger protections for these facilities than for drilling sites, and should not allow large-scale compressor stations anywhere inside the city limits. Experience has shown that relying on state and federal bureaucracies to regulate fracking operations will be a failure. Dallas must establish its own industry-funded office of gas drilling oversight with enough trained personnel, equipped with the latest technology, to be able to provide help to residents 24 hours a day, 7 days a week. I concur with the above statements…no drilling within the city of Dallas and no use of potable water for driling and a 24/7 oversight program. There is a wealth of information out there so that no one should be uninformed about this reckless, irresponsible process of natural gas extraction. We must transition to clean renewables or we will destroy the future of our children and our planet.